Tiger Woods survived, Graeme McDowell expired and Rory McIlroy produced the best round of a windy day in the Northwestern Mutual World Challenge at Sherwood Country Club. As tournament host Woods birdied two of his last three holes to follow his sensational 62 with a 72 and remain two shots clear of Zach Johnson (72) at the top on 11 under, McDowell confessed that he played “awful” to card a 75 that left him battling for the minor places in the final edition of the event before it moves to Florida next year. “Tough conditions today but I played awful,” McDowell said after a round that featured four birdies, four bogeys and a costly triple bogey six at the long, par-three eighth. “I am not in control of my swing and I have got a lot of work to do on my swing this off season. Yesterday was perfect conditions but when it is tough like today and you have to completely control your ball flight, it finds you out a little bit. I was off the boil today. As early morning rain gave way to stiff winds that swirled around the southern California venue, McDowell bogeyed the fourth, birdied the sixth but then dropped four shots in the next two holes. His ball sailed left into the bushes and was never seen again and he compounded the error by three-putting from long range for a six, having found the green with his provisional. Birdies at the ninth and 10th got him back to two over for the day but he did well to post a 75 in the end. After a bogey six at the tough 13th he birdied the 14th but then did well to get up and down from the drop zone for bogey at the short 15th after a visit to the hazard. He wasn’t the only one to suffer there as 10 players in the 18-man field made bogey or worse. The Portrush man did well to pitch and putt for his par-five at the 16th after a poor second into the hazard. But it was a better day for McIlroy, who had just 24 putts in a best of the day 68 to move up to joint 11th on two over par. The world No 6 hit just six fairways and only 10 greens but unlike McDowell, who had three three-putts, he holed everything in sight as he racked up seven birdies with his only mistake a double five at the 15th. Woods confessed that he struggled to cope with the swirling winds and commit to his shots and club selections. But having got back to one over for the day with a birdie four at the 16th, he was pleased to match Johnson’s birdie at the last with one of his own from around 10 feet. Not that it is going to be a two-horse race. Another former Masters champion, Bubba Watson, shot 69 despite a bogey at the last to go into the last day in solo third, just four shots behind Woods on seven under. Set to turn 38 on December 30, Woods might have gone five years without winning a major but he still continues to win despite some erratic weekend play in the big ones. Had he already got a target score in mind? 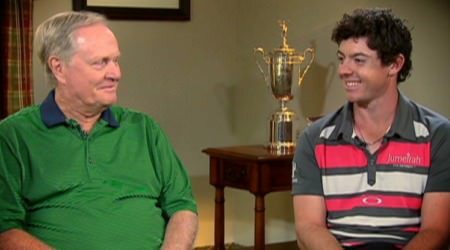 What appears abundantly clear is that while he has lifetime exemptions for the Masters and the US PGA, he has no intention of going on forever as he chases the four majors he needs to equal Jack Nicklaus’ haul of eighteen. Palmer played in 50 Masters Tournaments but Woods made it clear that while a golfer can still go on winning until well into his 50s, he will stop when he knows that victory is an impossibility. “You know, for me, I always want to win. So if I can’t win, why tee it up? That’s just my own personal belief. And I know what it takes to prepare to win and what it takes to go out there and get the job done, and there’s going to come a point in time where I just can’t do it anymore. 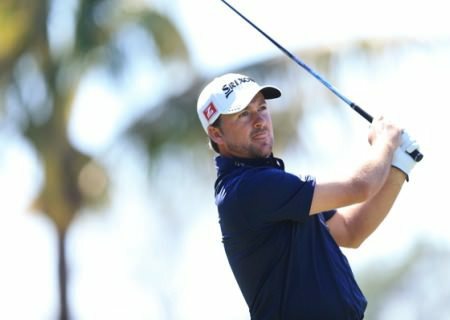 Graeme McDowell might have had an average day on the speedy greens of Sherwood Country Club but in outscoring big-hitting playing partner Rory McIlroy by a stroke he proved that power is not always the answer. A level par 72 to McIlroy’s 73 in his defence of the Northwestern Mutual World Challenge left him five strokes adrift of Zach Johnson, a player of similar qualities, but still well-placed to rack up his third win in his last four starts in Tiger Woods’ season-ending bash.